A long time ago, (1986) in the galaxy known as the Milky Way, a young boy named Peter Quill was abducted by a radical group of space pirates known as Ravagers. 26 years later, that young boy grew up to be known throughout the cosmos as the legendary outlaw, Star Lord (even though he only calls himself that). A person can pillage and plunder many things in 26 years, but it isn’t until Peter comes across a mysterious orb that he suddenly becomes the centre of a galactic manhunt. 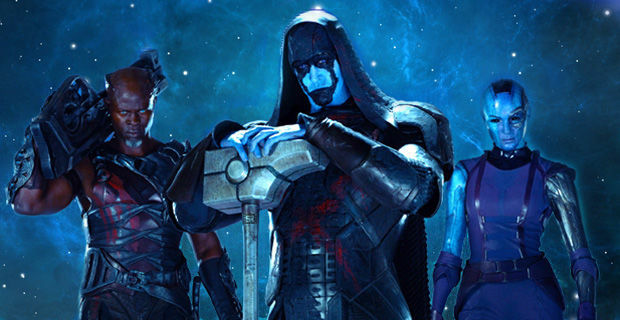 Peter, looking to sell the ancient relic, is hunted down by a host of creatures which includes a filthy rodent named Rocket Racoon (Bradley Cooper), a giant walking tree named Groot (Vin Diesel), a beautiful, deadly green female assassin named Gamora (Zoe Saldana) and a huge muscle bound warrior named Drax (Dave Bautista). Together, these selfish space misfits will join forces in order to discover the mystery behind the orb, why so many people are willing to kill or it and most of all, how to not kill each other in the process! From the set design, to the eclectic characters and exciting heroic stories, there is always something to enjoy in a Marvel Studios film. What makes Guardians so special though is how they take all those elements you love and create an entire new cinematic universe for us to enjoy. Now, you might say that this genre isn’t anything new but give an artist any form of art, and they will try their hardest to make it their own, and that’s what Marvel Studios has done. They have made it their own and that is why audiences have been reacting so positively. The main ensemble of characters are all unique and fun to watch. Chris Pratt does a great job being the film’s lead and fits his “Han Solo” like persona perfectly. This will definitely be a break out role for him and you can be sure this project will garner him many more blockbuster roles in the future. The fan favourites of the Guardians group are hands down Rocket Racoon and Groot. These are characters that no one has seen cinematically before and produces much of the film’s main levels of comedy. When you give a rodent giant guns and a filthy mouth with a tree that reminds you of a innocent puppy dog, the result is pure gold for all to enjoy. With so many new worlds, creatures, gadgets, ships and heroes to introduce us to, something had to take a hit story wise, and in this case, it was the villians. Though many of the antagonists in the film have great looks and and some cool action scenes, there isn’t much going on in ways of character except for rage and destruction. This was the same case in Marvel’s Thor 2 with their baddies: when you’re watching you just get the sense that they are there just for our heroes to mow through. Although this is also not a bad problem to have considering that there are so many catchy one liners and memorable scenes in this film. You won’t feel connected to these villians but it also won’t ruin the film for you. 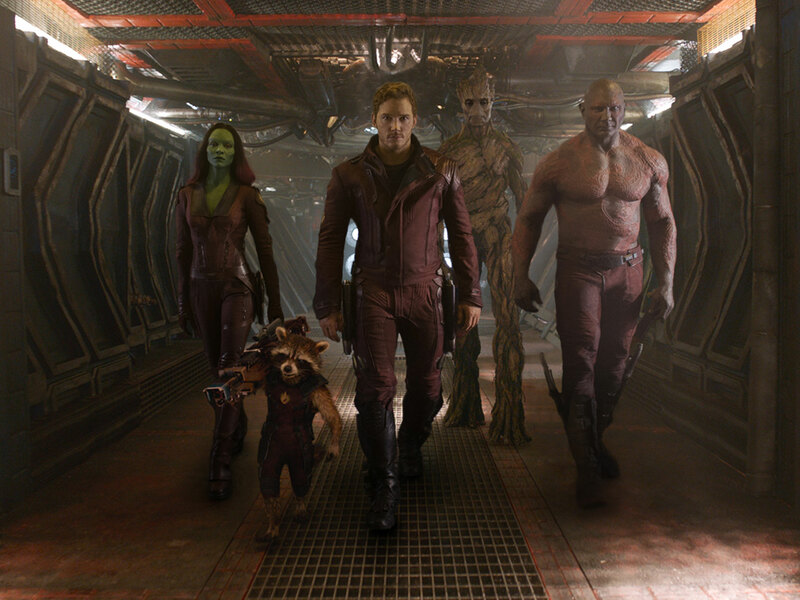 Guardians of The Galaxy feels like Star Wars, Star Trek and Indiana Jones all rolled into one. Director James Gunn has taken all the elements you love about your favourite Sci Fi/Adventure films and pieced them together like so many nerdy models we made in our mom’s basements. When this film was announced, Marvel and the film community knew it was a big risk for the famed studio. They could have easily played it safe and churned out another popular superhero film, centred around one person. Instead they took a big “cosmic” gamble and bet it all on that fact that as long as the movie is good, no one will care what the genre is or if the main hero is someone people know. The nerds have truly inherited the earth.